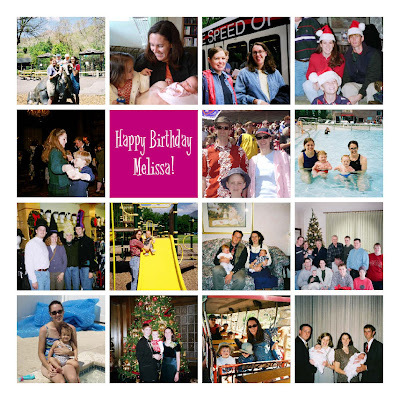 This post is in celebration of a couple of things: first, and most important, Melissa's birthday today. I'm not sure if she keeps me sane or if she just makes me feel like I'm not the only insane one. Either way, thanks Melis. Happy Birthday! Second, I've been taking old negatives to Costco to have them transferred to CD a little at a time, and I love having these on my computer. So it was easy to find a decade's worth of shots for this collage. If you want a closer look, just click it to enlarge. BTW, I did not come up with this format, I just copied Rachelle. Does this prove that I'm not a slacker? Wii love the Easter Bunny! The Easter Bunny has been good to us. Not only does he accommodate our request to come on Saturday instead of Sunday, but check out what he left in my basket! After filling up on candy at Jim & Joan's annual egg hunt, the boys are now ready to throw it out so they can earn a couple of games (Star Wars Legos is their current obsession). This year's egg hunt was fabulous, as usual. It was great to see all the Nichol cousins and the amazing kitchen remodel. The kids love to go there even when they aren't loading up with candy, so they were in heaven today. I'm going to try to get a slideshow on the sidebar soon, since, as usual, I took too many photos. I am a pasta snob. Sorry, it's true. One of the side-effects of living in Italy. 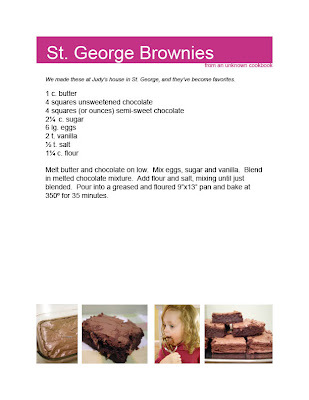 And I love this recipe. Even Ellie will eat this, so it passes the I-don't-eat-anything-but-cereal-and-bread-picky-eater test too. 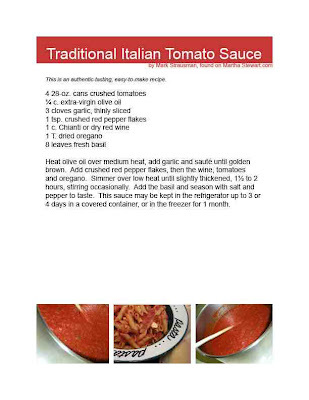 Best of all (as explained in the last post) if you've already prepared and frozen the Tradional Italian Tomato Sauce, you can have this on the table in about 15 minutes. Because pasta never goes out of season. 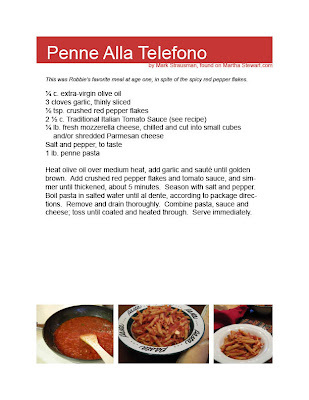 This recipe is the "starter" for my next post, Penne Alla Telefono. I make this and then freeze it in 2 1/2 cup containers, so when I need a quick dinner (like tonight) I can pull it out and have it on the table in 15 minutes. Because (according to Rob) soup season is now officially over, my recipes for Cheese Soup, Chili and Taco Soup will not be posted before fall. 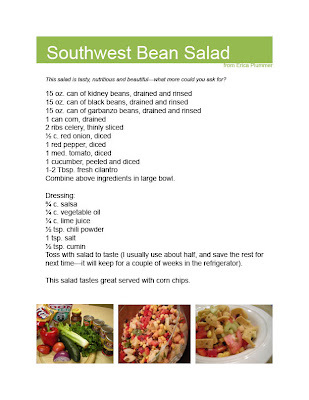 We are coming into salad season though, and this recipe is one of our favorites. Yesterday morning I got a phone call with caller ID of "Schools Public," which any parent can tell you is usually not a good thing. But it was Robbie, saying "Mom, I just wanted to remind you that it's the knighting ceremony today." I had seen the note inviting parents to attend, and put it on my calendar but had forgotten to talk to him about it, so I was wondering if he would want me there. I'm told that we're not too far away from that stage when he will deny even knowing me in public, so I was happy to get this phone call and to go to the school. Also, since my couch-supervising parenting style does not typically include any math coaching (in fact, there is some question as to whether I would be able to pass off the multiplication table in the timed tests), I am proud of Robbie, because he truly accomplished this third-grade feat on his own. Great job, Robbie! 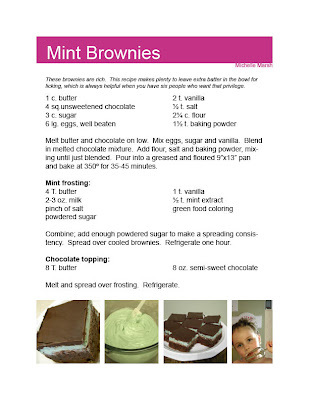 We have no plans to ever eat an all-green meal for St. Patrick's, but this might be our new tradition for dessert. 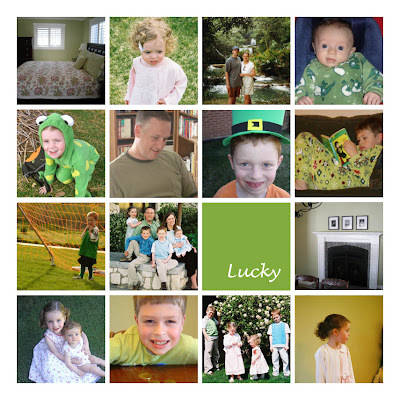 Just for fun, I scrolled through iPhoto looking for pictures with green...and they definitely made me feel lucky. Happy Birthday Dad (and Grandpa)! I'm not really sure how a 32 year old manages to have a 38 year old daughter plus eight grandkids, and frankly, he's not looking like a very young 32, but we're all glad he was born and that he's still young enough to remodel our houses! :) We love you! "Better than playing the Wii"
There is no higher praise from the boys. We went tubing at Soldier Hollow tonight with Logoworks, and as Ellie put it, it was "freakin' fun!" Both of the boys were disappointed to find out that there would not be enough snow in July or September to have their birthday parties here. We may need to repeat this activity during spring break—are you in, Stringhams? This is especially for Shawn and Melissa—we were talking about salad recipes this morning, and it gave me an idea of what to fix for dinner tonight. 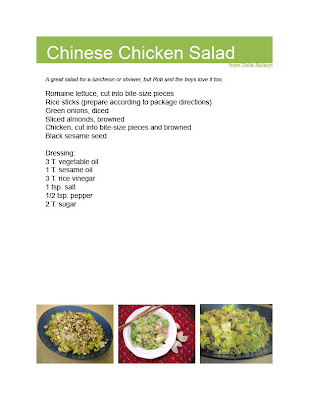 I love this salad, and it is so unbelievably healthy that I'm hoping it will offset our family home evening treat! Rob tells me he's posting his favorite side dish for this meal here. Or half-full, for that matter. This is my little victory today. I have been filling up this 2 quart pitcher everyday for about a month, in an attempt to overcome my perpetual dehydration. I have finally succeeded in emptying it before bedtime! I know, it's pathetic that I consider this an achievement, but maybe celebrating these everyday goals will turn me into an optimist after all. It looks like I might be posting about food again...like this might even be turning into a food blog, but no, this is a celebration of three everyday life blessings. 1) I spent less than $100 at Costco today! 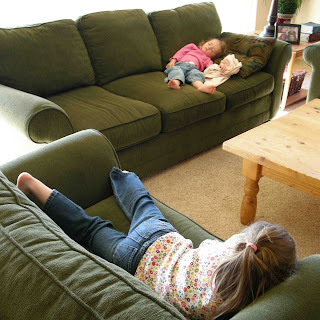 2) I only had to take one child with me, and as we like to say, "one is none." I vowed long ago I would never again take all four (I think it was after the time that Robbie gagged himself and threw up on Joey, who then freaked out for the duration of our shopping. I can't remember what I was shopping for, but it was something critical that we couldn't leave without getting. Ainsley is generally a great shopping buddy, and she is in heaven right now as she enjoys a feast of blueberries, strawberries and baby oranges for lunch. I really want to spend more one-on-one time each of my kids. They are so pleasant when they aren't annoying/bossing/bickering with each other. 3) I LOVE my new camera. My other digital point and shoot cameras always produced blurry shots. Thanks again, Mom & Dad, Davy, Chris & Cara! There are plenty of other things in these photos to produce gratitude (like food in the house and no chance of running out of toilet paper for at least a week) but I really need to get back to my laundry. I have to admit that I'm multi-tasking. I've been wanting to organize my favorite recipes into a cookbook with photos, so every time I make one I'm trying to take photos and type it out. I figure I might as well post them. This one gets made fairly regularly, since it literally the only vegetable (or fruit) that Ellie eats. Thank goodness for vitamin supplements, or she'd probably have scurvy or something. I switched the white flour for whole wheat and I add ground flaxseed and wheat germ too. It sounds super healthy, but still tastes great, I promise. This recipe makes three loaves, so you can give one away or freeze a couple, or just eat all three, like we usually manage to do. Since I already admitted that we sometimes consume more calories than Lance Armstrong could burn off, I might as well post one of few (semi) original recipes, which is clearly not a diet meal. 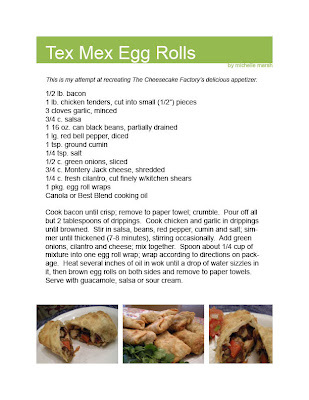 Last month we had dinner at The Cheesecake Factory, and I had their Tex Mex Egg Rolls, which were divine. I came home and did a Google search hoping to find a similar recipe, but didn't think any of them sounded as good as the original. So here's what I came up with, and it's pretty darn good if you're not opposed to fried foods. Actually, I don't have any idea how many calories these contain...they just taste so good I figure they must be sinful. Feel free to leave a comment if you want me to e-mail you a copy of the PDF—I can't figure out how to put it on here except as a JPEG. 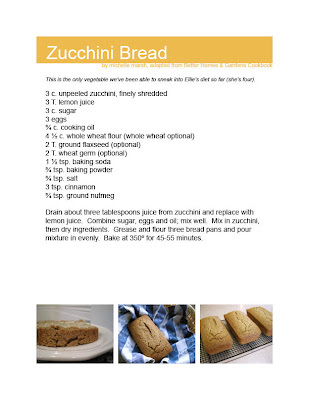 Edited: you can click on the recipe to enlarge and print it as is. At one point in my life I think I had a vague idea that I would scrapbook every photo I took. This was clearly pre-digital, so I didn't have thousands of photos stored in iPhoto like I do now, but even without this huge backlog I was never "caught up." So I'm trying to adopt Stacy Julian's Library of Memories system, scrapping my favorite pictures and telling our family story. Two catagories are "Places we go" and "People we love." Since I have to at least finish Ellie's and Ainsley's baby books before I can move on to other things, I'll post a couple of these shots here. Friday night we went to El Farol's with Rob's family. It is kind of a ritual. It's the first restaurant we went to when Ralph and Judy came home from their mission. We have a history of writing letters on the paper placemats and sending them to whoever is currently serving a mission. The food is good and we are in the back where the kids aren't too disruptive (although after Friday night we're all re-thinking that). I'll probably put these pictures in the "Places we go" album, although they are also "People we love." Saturday morning we met my cousin Claudia and various other cousins at Hagermann's. It was so fun to see Claudia and catch up, and Hagermann's is the my family's ritual equivalent to Rob's family at El Farol's. Claudia definitely gets a page in our "People we love" book, and we're going to have to make another trip to Alaska to get more photos for it. The only thing better than Hagermann's for breakfast is Hagermann's for lunch. But I'm thinking that an eight mile run is probably not long enough to compensate for the calories consumed there. I keep telling Chris he needs to open a location in the new Cottonwood Mall development, but it might not be the best thing for my middle-age metabolism. It needs to be a "Place we go" less frequently, not more!